But they never fixed the Off-Model Wigglytuff. When TV writers depict a foreign culture, they're prone to not doing the research, which results in all kinds of mistakes. Sometimes, however, the errors made by those unfamiliar with the culture in question will be corrected by those who are. That is, translators adapting the show for their own country. Common in English dubs of anime, which fix Gratuitous English, but can occur with Western media when imported into a country other than the default one. Compare Woolseyism. Not to be confused with the Blind Idiot Translations that are sometimes corrected into this, or with Translation Convention. In Spanish dubs of the Sword & Sandal genre, it is expected to render all toponymics mentioned in the dialogue in Latin or Latinized form, even if they were not in the original language. For example, Maximus from Gladiator is known in the Spanish dub as "The Hispanic" (El Hispano) rather than "The Spaniard" (El Español), and Agrippa's reference to Britain in Rome is translated as "Britania" rather than "Bretaña" (or "Gran Bretaña"). This custom caused a problem when it came to translate Maximus' birthplace, Trujillo. Leaving it in Spanish would sound horribly anachronistic to a Spanish audience but the Latin name (Turgalium) would be meaningless, because it is not well known (the place was and remains a small, sleepy town, only known as the birthplace of some conquistadors in the 1500s). The dub team changed it to Emerita Augusta (nearby Merida's Roman name) and justified it saying that "Trujillo doesn't combine the 'qualities' to be cradle of the gladiator." See Woolseyism. The MAGI supercomputers were referred to as Magi Baltasar, Magi Casper, and Magi Melchior.note This is in reference to a pop culture version of the three wise men who visited Jesus. Magi is the nominative plural or genitive singular of magus, so this was corrected in the English subtitles to Magus Balthasar and so on. however, a commentary track on the Platinum DVD release reveals that the translators had a hard time convincing Gainax  with whom they were in communication to ensure they got terms correct, and had used "Children" intentionally  that "Child" was a better choice. Asuka's Gratuitous German is quite nearly intelligible in the English dub, unlike the original. This is due to Asuka's American voice actress being proficient in German. The writers gave her the lines in English and she translated on the fly. In The Big O, the main character at one point was called Megadeus Dominus [Big-God Master] and the translation changed it to Dominus of Megadeus in the dub and Dominus Megadeum (deum being accusative of deus) in the subtitles. Assuming the genitive "Master of the Big-God" was intended, the latter is still incorrect: the proper genitive case is actually Megadei. Sometimes Japanese creators come up with a name that is just flat-out wrong, necessitating any foreign licensors to try and fix it. Such titles include Brain Powerd (should be Brain Powered, though one can argue Xtreme Kool Letterz being in effect), Chrno Crusade (Chrono Crusade outside Japan), and most infamously Erementar Gerad (Elemental Gelade outside Japan). The Chrono Crusade anime nonetheless had other issues the translators couldn't be bothered to fix  an on-screen caption indicates that the story is set in the borough of Brooklym. Oops. Most characters in Fullmetal Alchemist have European names. This includes Major General Olivier Armstrong. While Olivier is a perfectly correct French first name, it happens to be a male one, despite Major General Armstrong being a woman. The French print of the manga changed it to the feminine form, Olivia. The English dub of the original Mobile Suit Gundam featured the famous city "New Yark", along with the "Great Canyon" in the former United States. These were corrected by Yas Yasuhiko when he did the manga adaptation Mobile Suit Gundam: The Origin, where all the names were restored to their real-world spellings (except for "New Yark" being changed to Los Angeles for some reason). The latter change may not be related to translation, since for years there's been some confusion over whether a certain event (Garma's death) took place in New York or California. Inconsistent references, animation, and guidebooks are to blame for this. And then there's the ones that say it's Seattle, which does make a degree of sense, considering that the White Base's next stop was in British Columbia. This is possibly supported by the fact that, during that event, White Base hides out in what appears to be the Kingdome. In the Death Note anime, soon after Near shows up, an American FBI agent identified as Rally Connors is introduced. The English dub changed Rally to Larry, a much more common name. Narmful as some of the bizarre names in Death Note may be, the point of them was that they were so weird nobody in the real world would have them (in a story about a demonic notebook that kills anybody whose name is written in it, it's no trivial concern). "Larry Connors" is far more likely to be a real person than "Rally Connors". Indeed, yournotme.com tells us that there is at least one Larry Connors in the UK but needless to say no Rally Connors. The Black Beauty Sisters' Invocation, "It's a show time! ", is corrected to "It's showtime!" in every English release of Mermaid Melody Pichi Pichi Pitch, even the error-ridden fansubs. The anime (Japanese version) corrected this, too: you can clearly hear the Black Beauty Sisters yelling "It's show time!" before singing their songs. The Pokémon anime has done this a couple of times. Occasionally, the original will have a trainer call an attack the Pokémon cannot use. The dub will fix this by having the trainer call a similar looking move it can use. For instance, when Ash battles Roxanne (Hoenn's first Gym Leader), she has her Nosepass use Hyper Beam in the Japanese version. Nosepass can't actually learn that move in the game, so the dub changed it to Zap Cannon, which it can use. In another case, a trainer has a Bronzor use Teleport and the dub cut the scene out. 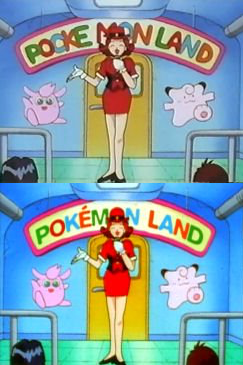 Shown above: An early episode had a sign reading "Pocke Mon Land" (Pocket Monsters) in the original, which the dub corrected to "Pokémon Land" (however, it was apparently done before the Japanese officially romanised the name as "Pokémon", but even before then it was Pocket Monsters). While Pokémon has corrected things like this, there have also been cases where it was averted by 4Kids missing things, one notable example is the Primeape episode where you have an advertisement for the "Pockemon Leag". Norman Grossfeld and Michael Haigney also lampshade an instance in the DVD Commentary for Spell of the Unown where they forgot to fix an instance of "UNKNOWN" into "UNOWN" (not to mention the general atrocious English in the shot in question, but it was practically a Freeze-Frame Bonus). This is just one example of one of the few things the 4Kids dubs fix for all the things they "break". There is also an instance in One Piece where a sign was changed from "BooK" to "Books"
Among much other Gratuitous English, the Britannian Empire of Code Geass had a organization called the "Knight of Rounds". The dub changed this to "Knights of the Round", which was obviously what they were going for. During the World Tour episodes of Digimon, Ken and Matt are assisted by a young Mexican DigiDestined. In Japan, her name is Chichos, which is one later away from Chicho, the diminutive of the Spanish male name Narciso. (On its own, it really isn't a name or meaningful at all, and it's also one letter away from "chicos," meaning "boys.") The English and Spaniard dubs renamed her Rosa, and the Latin American dub Guadalupe (a stereotypical Mexican girl name if there is one). In the English dub of the same arc, the Australian boy Dingo becomes Derek. The "White Nuts" in Red Photon Zillion were renamed the White Knights for the American release. The creator was reportedly upset to find out that "Nuts" in English could mean insane. While the 1996 Canadian version of Sailor Moon was notorious for being badly adapted and translated, there's one thing that was fixed: Sailor Mercury's computer once had a joke showing the directives from RoboCop. The adaptation changed the subject to J. Smith and fixed the spelling of "innocent". The English release of Negima! corrected a grammar error in a spell that was written in one of their several Gratuitous Foreign Languages. except she mistakenly offers to be the uninjured leg) in a scene. The English dub and DVD subtitles changed the line to be consistent with the visuals. This makes it incorrect with respect to the spoken Japanese line, but which error are English-speaking audiences more likely to notice? In One Piece, there is a cover page where the shipwright Zambai talks to a customer. He asks the following question in a speech bubble with English text instead of the usual Japanese: "Three ship. And cola?". The official English translation correctly added plural so that he now says: "Three ships. And cola?". In the original Hellsing Ultimate OVA, Pip Bernadotte says Frankenstein when he clearly means the monster. The English dub corrected it. The English dub also corrected the main character's name. In the original Japanese, his name is pronounced Aakaado and the subtitles render it "Arucard", but the dub says "Alucard". This led to a bizarre argument between the English director and the Japanese producers (recalled in a commentary)  the director wanted the name changed to "Alucard" since it's clearly Dracula backwards; the Japanese insisted the name must remain "Arucard" because it's Dracura backwards. A doormat in Dragon Ball Z read "WELLCOME." The early FUNimation version fixed the spelling by removing one of the Ls and placing the remaining letters closer together. One of the characters of Kaitou Saint Tail is Seira, a girl who is a part-time nun after school. Since this is something that applies to mikos but not nuns, the Italian dub turned her into a pair of twins: Sara (the nun) and Mara (the regular schoolgirl). Occasionally in the Motor Ball arc of Battle Angel Alita, the name of the sport is rendered in English as "Moter Ball", and the name of Alita's manager, Esdoc, as "Esdog" (even managing both mistakes in one case - "Esdog Moters"). This was corrected in the flipped Viz releases, but left untouched in the later unflipped Kodansha releases. In one Tintin book, the name of the Banana Republic was San Theodoros... Theodoros being a Greek name... It was changed in Spanish to the correct form. "San Teodoro". A Spanish inscription on a statue in The Broken Ear names the country as "San Teodoro", at least in the English edition. The Black Island was extensively corrected when translated into English, changing everything from names (making sure Scottish characters had names that were actually Scottish), to the uniforms of the police officers and even the paint job of the trains, to be as realistic as possible. In X-Men, a recurring enemy is named Kenuichio Harada, aka the Silver Samurai. However, Kenuichio is an As Long as It Sounds Foreign name, not an actual Japanese one. In the Japanese version it becomes Kenichiro. Notably, when the character appears in The Wolverine (albeit as a Decomposite Character), the film ditches the first name altogether, only calling him Harada. There was an Uncle Scrooge story in which the Ducks visit Valhalla. The story suffers from various cases of Sadly Mythtaken, most obvious being that Valhalla was supposed to be the afterlife, while in the story it was depicted as the residence of the Aesir (as opposed to, say, Asgård). In Scandinavia and Finland, the horses pulling Thor's chariot were edited away and replaced with goats. Unfortunately, the artist responsible for the edit wasn't exactly as skilled as Carl Barks, so the goats ended up looking Off-Model. In Anastasia, Rasputin in his song calls Anastasia by her amnesia alias (Anya), even though he has no reason to (other than to fit the song's meter). The Russian translation of the song changed it to Nastya, the diminutive form of Anastasia. The Swedish dub of Frozen changed Kristoff's name to Kristoffer, which is a far more common form of the name in Scandinavia. Consequently, Anna's Accidental Misnaming of him is changed from Kristoffer to Kristian. In Hidalgo, one of the character is worried about becoming a fifth wife to her future husband. However, in Islam, you are not permitted to have more than four wives simultaneously, so when it was translated into Egyptian Arabic, the references to fifth wife were changed to fourth wife. In American Pie, Nadia is referred to as "that Czechoslovakian chick," despite it being 1999. This was changed to Czech in (at least) the Czech and Russian dubs. In Salt, the titular character is Russian, but her name is given as the masculine Chenkov rather than the feminine Chenkova. This is corrected in the Russian dub. The Russian dub of The Dark Knight Rises renamed Dr. Leonid Pavel (the poor guy has two first names instead of a first and last name) to Leonid Pavlov. The Japanese dub of Rising Sun changes the name of a Japanese character, Jingo Asakuma, to the correct Junko Asakuma. The Spanish dub of Angels & Demons changes Langdon's comment that "there have been many [Pope] Marks and Johns, but never a Luke" to "there has been one Mark and many Johns, but never a Luke". The line "I think World War II just started" in Pearl Harbor was so universally mocked (what, with World War II having been underway for two years before the Pearl Harbor attack and the film itself featuring an earlier subplot about the German bombing of Britain), that it was omitted from later English re-releases. It was never a problem in Spain, however, because the local dub had already changed it to "They just threw us into World War II!" English translations of Around the World in 80 Days fix Jules Verne's original references to Utah's "Lake Salt City". The German translation of Michael Crichton's Next fixes a German headline. The original had the headline as "Affe spricht im Dschungel, Flüche George Bush", which is a word-to-word translation of "Monkey speaks in the jungle, curses George Bush" - only that Flüche is not the verb, it's the noun. So the German version corrected it to something more headline-y, something to the effect of "Affe schwingt Reden, Zeugen verschlägt es die Sprache", which would be in English: "Monkey talks big / makes a speech, witnesses are speechless". Tales of the Magic Land, which began as a translation of The Wonderful Wizard of Oz, changes the Tin Man to the Iron Woodsman, since tin doesn't rust in Real Life. The Hunt for Red October: Marko Ramius is not a realistic Lithuanian name (if anything, it's closer to Latvian), so most Russian translation change it into more plausible Marius Ramenas. The Russian dub of Stargate SG-1 fixed some mistakes in the episodes dealing with Russians — in particular, the horribly-accented Russian dialogue from "Small Victories" was dubbed over, and the surnames of Dr. Svetlana Markov and Lieutenant Tolinev (both being women) were changed to their correct feminine forms — Markova and Tolineva, respectively. It's possible that the creators of the show realized their blunder and corrected in the episode "Full Alert". Daniel goes to Moscow and goes into an office looking for a "Captain Voronkov". The woman in the office tells him that she is Captain Daria Voronkova. The Russian translation of Hercules: The Legendary Journeys correctly changes "Hercules" to "Heracles", which makes more sense given that the show deals with Greek myths ("Hercules" being the Roman equivalent of "Heracles"). However, the reason for this is less the correctness of the name and more the familiarity of the Russian people with the myths of Heracles, whereas Americans are more familiar with the name Hercules. Besides, when most Russians hear the name "Hercules", they think of a brand of oatmeal. Oddly, he retained the name Hercules in the Xena: Warrior Princess crossover episode "Prometheus", despite both shows airing on the same channel and being dubbed by the same company. The German dub of the "The Great Game" episode of Sherlock mixed this with Woolseyism. In the original, a grammatically challenged Belarusian prisoner says that if Sherlock can't get him off, he'll get hung, which Sherlock corrects to hanged. In the dub, the prisoner gets the grammar right on the last sentence, and Sherlock corrects it to shot, the actual execution method in Belarus. The number of people killed in the Madrid train bombings is changed from 173 to the correct number, 191 (173 was a number reported early after the attacks). The location of the pro-ETA demonstration is changed from Barcelona, over 400 km away, to Bilbao, in the Basque Country. The conversation between Pierce and McNulty about the Spanish constitution and Basque autonomy is different.note The change is greater than it seems. 1978 wasn't the amendment of an existing constitution to grant autonomy to the Basques as the original dialogue implies, it rather was the creation of a brand new constitution after 40 years of dictatorship during which the previous one from 1931, that also recognized Basque autonomy incidentally, was suspended. The Spanish version also makes it clear that this is a regional autonomy, not an ethnic one: i.e. A Basque that lives and pays his taxes outside the Basque country has the same rights and duties as any of his non-Basque neighbors (and viceversa). Pierce: It doesn't seem they can't choose, Sir. In 1978 Spain changed its constitution to give Basques national autonomy. McNulty: That's semantics, Pierce. They don't want some half-assed law, they want their own damn country like the Serbs and the Kurds and the Palestinians. Pierce: But the Spanish Constitution of 1978 granted regional autonomy to the Basques. In Power Rangers Wild Force reunion episode "Forever Red", after the Red Rangers morph, they yell what colour and series they are from e.g. "Red Turbo Ranger", "Red Space Ranger. Leo and Wes oddly yell "Go Galactic" (the morphing call) and "Time Force" respectively, as opposed to "Red Galaxy Ranger" and "Red Time Force Ranger". This was fixed in the French dub. W. H. Auden and Chester Kallman's English translation of The Rise and Fall of the City of Mahagonny corrected the Gratuitous English in "Alabama Song" and "Benares Song"; as they explained, "pidgin English...is extremely effective when it appears in the middle of a German text, but when sung by characters to whom English is their native tongue, it has no point." The Polish version of 7th Sea changed the battle of Tannenberg to the Gruenweide, and corrected many nonsensical Ussurian (Russian) names of spells. The German version similarly changed Tannen to Tannheim, Insel to Inselburg, die Schwartzen Walden to die Schwarzen Wälder and a whole host of other things; for some reason, Fauner Konrad Pösen was left intact, even though Fauner is not a name in German and Konrad is a male first name (the character is female). The French version also changed the names of the noble families in Montaigne (France). In the Japanese version of Snatcher, "JUNKER" was originally an acronym for "Judgment Uninfected Naked Kind & Execute Ranger". In other words, a series of randomly-chosen words strung together with no coherent meaning whatsoever (then again, it is a Hideo Kojima game). When the game was ported to the Sega CD for the western market, the meaning was changed to the somewhat more sensible "Japanese Undercover Neuro-Kinetic Elimination Ranger". The Fan Translation of Rosenkreuz Stilette did this with the game's many instances of Gratuitous German. Thunder Force V's boss descriptions, which were already in English in the Japanese version, were rewritten in more grammatically correct English. The voice that reads out the description, however, still goes by the descriptions from the Japanese version. The Japanese version of Yggdra Union has a female character named Emilio. While most Japanese players wouldn't know any better, the name sounds very masculine to the average Western audience. To avoid any unnecessary raised eyebrows, Atlus opted to change her name to the similar yet much more feminine "Emilia" when they translated the game into English. The weapon "Thor Hammer" in Fire Emblem Awakening, which had shown up in previous games but never in English, was properly renamed Mjölnir in the English localization. Likewise the ultimate wind spell, which was generally romanized as Holsety before, was changed to Forseti, which gets the mythological reference right. For a non-weapon example, Panne (a shape shifter who can turn into a giant rabbit-like creature) would say "Humans can be somewhat strong, too," when offering to pair up with someone in battle in the Japanese version. Since she can say this to the army's Manaketes (dragon shape shifters) as well, the English version corrected it to "Taguel aren't the only strong creatures out there." The Japanese-developed Game Boy Color port of Lemmings & Oh No! More Lemmings had numerous level name typos that were corrected for the international release. For Hatsune Miku: Project DIVA F, some slight instances of Engrish were corrected. For example, "Rest X Notes" seen during a Technical Zone became "Notes Left: X". The localization of Super Valis IV corrected "Clistal Pillor" to Crystal Pillar, and fixed some truly ridiculous Engrish in the ending scene. In Super Mario World, coin patterns at the end of Special World spell out "YOU ARE SUPER PLAYER!" in the Japanese version; the translated version adds an "A" after the second word. The Bonus Boss of Golden Sun: The Lost Age has an attack that turns his sword into a gigantic lightning bolt called Formina Sage. When it returns in Golden Sun: Dark Dawn, the attack is now Fulminous Edge. The Russian translation of Assassin's Creed: Chronicles: Russia corrects Nikolai Orelov's last name to Orlov. Presumably, the well-meaning creators translated "eagle" into Russian ("oryol", although sometimes written as "orel") and added the common Russian "ov" ending. What they forgot was that, in some cases, a vowel may need to be dropped. The bits of Korean dialogue that was originally in Yakuza 2 was not exactly fluent to say the least. When the PS2 version was localized for South Korea, Sega brought in native speakers to re-record all the spoken Korean in the game. The re-recorded Korean ended up being used instead of the original broken Korean for the later PS3 and Wii U ports in Japan. In the Japanese version of Resident Evil 2, Dr. Birkin's letter to Chief Irons makes reference to the surviving S.T.A.R.S. members from the first game, mentioning each of them by their first names (e.g. Chris, Jill, Barry, Rebecca and Brad). While this is not incorrect, it is unusual for someone like Birkin to refer to people he never met on such familiar basis. This was changed in the English version, where he uses their last names (e.g. Redfield, Valentine, Burton, Chambers and Vickers) instead. The Ada Wong campaign added to the PS2 version of Resident Evil 4 was titled "The Another Order", which isn't grammatically correct to say the least. In the English version, this campaign was retitled "Separate Ways". Muv-Luv Extra has some Valger-On dialogue that's in rather terrible English. When it was finally officially localized over a decade later, the English was rerecorded so that it sounds natural. Looney Tunes cartoons featuring Speedy Gonzalez are rife with fake Spanish and bad Mexican accents. This is not an issue with the Spanish dubs, which were done by real Mexicans, and is likely the reason why he's the Trope Namer for Mexicans Love Speedy Gonzales. Oroku Saki and Hamato Yoshi are not exactly real names in Japanese. When the 1980s Teenage Mutant Ninja Turtles animated series was dubbed for Japanese TV, the two characters were renamed Sawaki Oroku and Yoshihama Takeshi respectively (both names in surname/given name order). The infamous "omelette du fromage" from Dexter's Laboratory was corrected in the French dub to "omelette au fromage", but this episode still remains weird in French since there is no reason why no one understands Dexter, everybody thinks he is super cool (especially since he is saying "omelette with cheese") and the on-screen appearances of the words are not corrected. In The Simpsons, Bumblebee Man's Spanish tends not to be very good, and he speaks in a thick American English accent. The Mexican dub of The Simpsons gave him a completely new voice so he could speak proper, native-sounding, and correct Mexican Spanish while still sounding like the Chapulin Colorado pastiche he's supposed to be.